I have never felt such an uncontrolled feeling as I did on the day I did my first pregnancy test, that second faint line was the beginning of the rest of our lives, I was overwhelmed, I don’t think I’ve ever felt so many emotions at one time, I’d finally become a mum, someone was going to count on me for the rest of their life, I told my partner and our close family, I couldn’t wait for the first midwife appointment or the first scan! So much so I booked a private scan and took my niece and nephew with me and my partner to go and see our little bean for the first time, I was 7 weeks at the scan, the fluttering little heartbeat melted my heart, it was the most beautiful thing I had ever seen! I left after buying our scan picture and felt on top of the world! A few weeks later I began spotting, rang my partner and he rushed from work to meet me at the hospital, spent hours sat there, spent hours feeling numb, to be told everything was fine and they couldn’t find a sign of miscarriage, so we went home at around midnight, still feeling numb, now thinking about it, I would call it mother’s instinct… I woke up at 4:50am with crippling pains, I couldn’t move, I lay there for hours… tossing, turning, crying, hoping it was all a nightmare, I finally woke my partner up at 6:00am… none of us said a word, we both already knew our bean hadn’t made it, we got to the hospital and it was confirmed that I was no longer pregnant… I almost couldn’t breathe, I’ve never felt such an emotion crippling pain in my life! 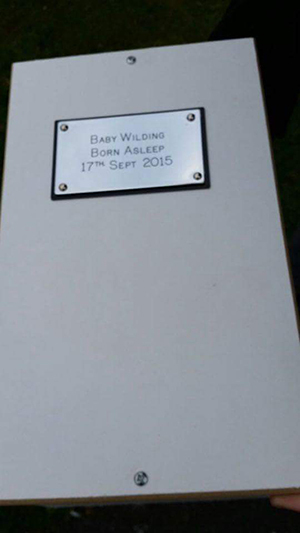 We arranged a private cremation for our baby, it felt as though it was the least we could do, we filled the casket with cards, presents and a letter. Not one single day has passed since the 17th September that our baby isn’t on my mind, I love my baby and I always will! On the 17th of September every year I plan to have all my close family and friends round, even if just for a chat, just as they would have been round to celebrate Addison’s birthday!